Tweetdeck, one of the most popular Twitter clients, has raised $2 million in a previously undisclosed round of funding, according to angel investor John Borthwick. He revealed the funding at TechCrunch’s Real-Time Stream CrunchUp, during a panel discussion bewteen Michael Arrington, and investor Ron Conway. Tweetdeck, which recently launched a TechCrunch-branded version, raised a small round of angel funding in January, estimated at $300,000. 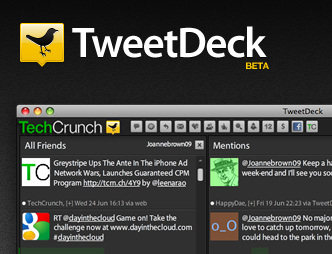 TweetDeck is available for Mac, Windows and Linux, it just requires Adobe AIR. The company has been working on getting more services integrated into its client. Last week, it launched an iPhone app that has been gaining popularity quickly.